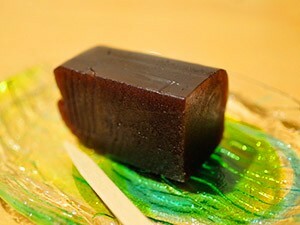 The Youkan-iro, is a dark brown tinged with slight redness, such as jelly confectionery as its name. In color name from the Edo era, it is to “Somemonochouhouki” has been referred to as the same color as the “Momoshiocha”. At the time, “Youkan-iro” was used to adjective the like that have faded clothes of black dyed or dark purple. Since the old days of black-dyed had been dyed black after the bottom, such as dyed in red and blue, the color comes faded I had become just the color, such as jelly. Black figure of poverty samurai of the characters, even “Yumekin” classic rakugo “I place you want to say that crested of KuroHabutae5 one place, but black is burned, because it is black is dirty crest YoukanHabutae black crested” and, that faded It has described as “crested of Youkan” the crested. Yokan is, in general is that of sweets solidified with agar poured bean paste of red beans to type. It was transmitted from China in the Muromachi period, but the jelly at the time was “steamed jelly”. After that, it has got to be the entered transparent sense of agar, such as the early Edo period to the current “Neri Yokan” is made.